Richie Sexson, hitting .218 with 11 HR and 30 RBI this season, was released Thursday by the Seattle Mariners. The 33-year-old first baseman/outfielder has had many issues this season, and beyond his offensive performance. 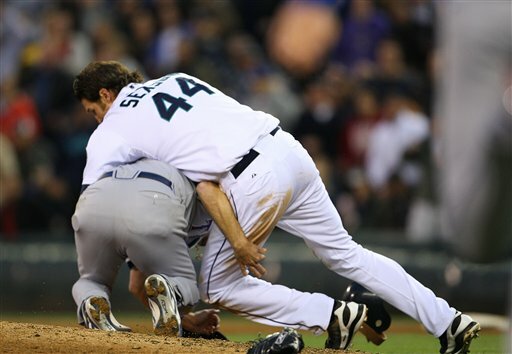 He has brawled, been outspoken and generally a nuisance in the Seattle clubhouse. But could he fit with the Phillies? And I also remember Manuel told Comcast SportsNet he wants a “professional hitter,” a guy with some pop who can hit singles, too. Well, Sexson may not represent that kind of hitter, but he could be the right-handed bat the Phils are looking for off the bench. He’s worth $14M this season, but the Phils wouldn’t have to pay all that (just a portion, likely).